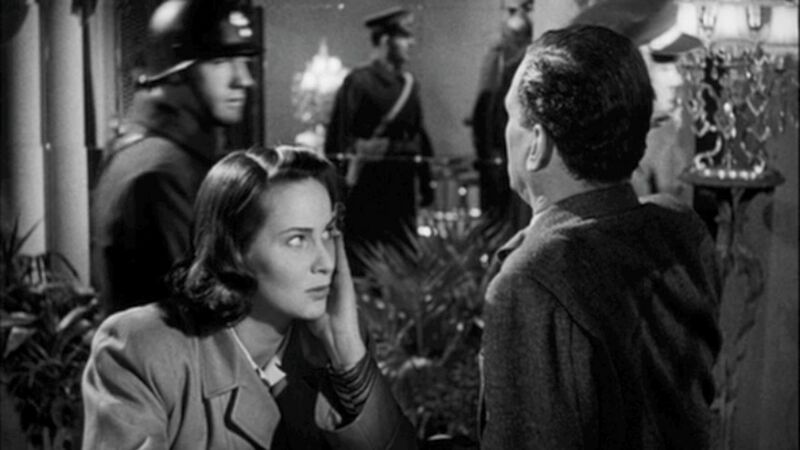 Holly’s relative immunity, or indeed Rick’s relative immunity in Casablanca, can be traced back to the same essential understanding that allows Holly to behave in such a way. That understanding is simply the assumption of American exceptionalism, a concept that for better or worse can be linked back to German theorist Carl Schmitt (no relation to Anna Schmidt as far as we know). According to Carl Schmitt, the power of the sovereign, or indeed the power inherent in any system of government, is the power to decide the insaturation of the “Ausnahmezustand” or literally, the “state of exception.” Whether this be martial law, executive order, or in the case of World War II Germany, Hitler’s assertion that “Der Führer schützt das Recht” (The leader defends the law), the state of exception is the exercise of executive power. For Schmitt, every government, in order to have power, must have some element of dictatorship/sovereignty and this element holds the power to decide the exception. As Holly strides effortlessly through police lines, thumbing his nose at the British officers, and living for free on the promise of delivering a lecture on the modern novel, he is the picture of privilege and exception. American involvement in World War 2 is no exception to American exceptionalism. While the rest of the world and especially Europe was still staggering from the horrors of The Great War, they were unwittingly embroiled into this terrible conflict, but it was years before the US took a side. While the United States’ geographic separation certainly permitted some amount of political separation, even after years of increasing aggression in Europe, it took a direct attack on a US military base to initiate American involvement in the war. The presumption that the United States does not exist as a part of the same world as the more cosmopolitan Europe is the same heart of American exceptionalism that has infected Holly’s behavior. This perspective can be traced back even as early as the early 1800’s, with the Monroe Doctrine dictating that European Imperialism in the nations of the Americas was over, but that American involvement in those same nations was permitted. Talk about exceptionalism, yet the great blue expanses of the Atlantic and Pacific ocean have long served as a metaphor for the emotional and political separation inherent in American sovereignty. Holly, blustering his way through postwar Vienna with the bravado that we have so often called cowboyesque, is nothing but a visualization of this exceptionalism. What would make Holly think that a cowboy, or even a hard boiled California detective like Sam Spade or Phillip Marlowe, could have the right to do as he please in this downtrodden European city? Holly is the imago of American exceptionalism staggering in and out of shadows on these cobblestone streets. And in his meandering, Holly is continually endangering the lives and livelihoods of the people around him. In addition to drawing unwanted attention to Anna, a woman without viable papers, Holly’s big mouth will soon (as we will come to see) pull the strings that endanger the life of another character. In his haphazard western/detective investigation, Holly will let slip something that he shouldn’t have. And why? Holly is trying to prove his friend’s innocence, but more simply he wishes to exercise the near limitless power of his personal blend of American exceptionalism–an exceptionalism that, more often than not, harms those who are not swathed beneath its protective red white and blue cloak.